Kaddal Merril duo will be performing at Cairo’s Al-Dammah Theatre on 17 August, joined by Mokhtar and Bouda Abul-Yazeed. 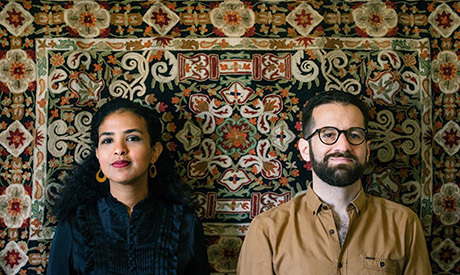 Kaddal Merrill is a collaboration between Egyptian flautist Fayrouz Kaddal and British musician Daniel Merrill, celebrating folk and heritage and their mixed roots. By combining flute and violin their music is inspired by Nubian, Oriental and British musical traditions. They have performed at festivals in the UK and Denmark. The duo will be joined by percussionists Abul-Yazeed and Mokhtar on the tabla, duff and req. Kaddal trained as a Western classical flautist. A passion for folk and traditional music led her to join High Dam Band, to perform with FluNay, and forming and performing with Felouka band. Abul-Yazeed is a member of Hawas and Bahgaga bands, as a percussionist, body percussionist and drummer. Mokhtar is a musician and instructor of percussion in both the Oriental and Latin genres. Over the past eight years he performed alongside many of Egypt’s bands and singers, including Youssra El-Hawary, Shereen Abdo, Nagham Saleh, The Choir Project and Bahgaga.